Comments Among one of the most trying times for any individual are the planetary periods of the karmic planets or situations arising due to specific position of karmic planets in one’s natal chart or horoscope. 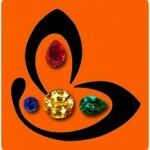 Planetary gem therapy goes a long way in such a situation to bring comfort, stability and peace to the individual. 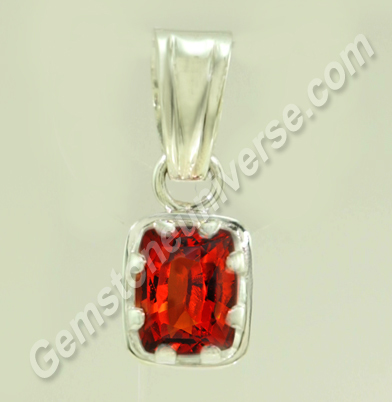 Featured today is the gemstone of karmic planet Rahu – a fine natural treatment free hessonite of 3.19 carat set in sterling silver as a Rahu talisman pendant. The cushion cut natural hessonite from Sri Lanka has a lovely deep burnt cinnamon orange color uniformly spread across the gem. The clarity and lustre of the gem are amazing and only enhance the raw fiery appeal of the hessonite. Hessonite is a grossular garnet. Also known as gomed/ gomedhaka in Vedic astrology, it is the gemstone of Rahu or the North node of the Moon. Rahu is also known as the Dragon’s head. Natural hessonite can be worn in the planetary period of Rahu but should always be done after getting a proper gem recommendation. Planetary period of Rahu invariably brings lethargy, inability to stick to a routine, confusion and frustration because of elusive success. You can access a great resource to know about the way this karmic planet Rahu functions by clicking here.